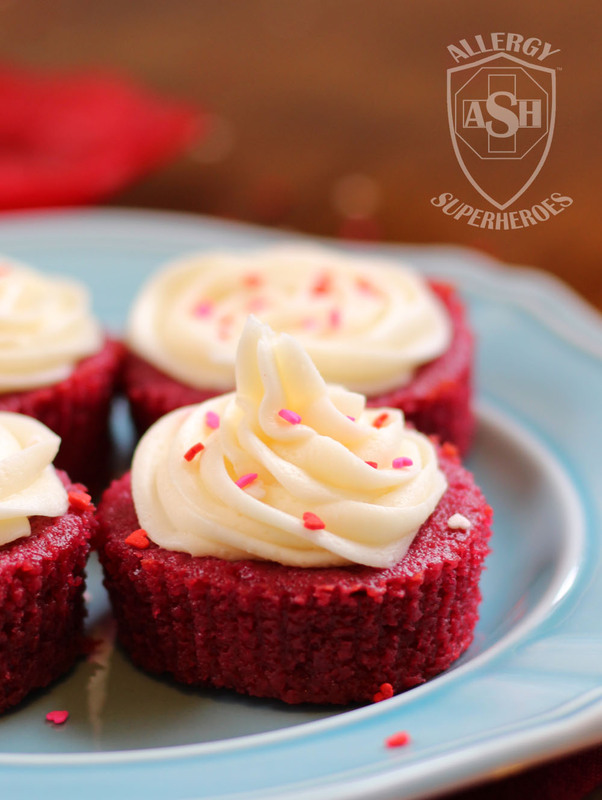 Did you know that traditional Red Velvet cake uses a whole little squeeze bottle of red food coloring? You can use less if you have the super pigmented stuff, but still, that’s a lot of artificial food pigment. Some people have documented allergic reactions to food dye, and there are also behavioral links to the stuff. It’s definitely not the best for you. Personally, I have not been able to move myself away from artificial colors entirely, though I’ve been limiting them except for my sons’ birthday parties (when I tend to go to town on the frosting.) I have been looking at alternatives more often though, and toying with using beets as the color source for Red Velvet Cake. I was worried it would taste like beets, and there was a bit on my first try, though I was the only one who seemed bothered by it. Zax even ate several of that batch without frosting, and he didn’t make any complaints–and let me tell you, that kid is picky! I felt it was too beety though, so I reduced the amount, and now I don’t taste beet anymore–and you won’t either, especially once they’re frosted with my tasty Cream Cheese Frosting. Here is what I came up with! 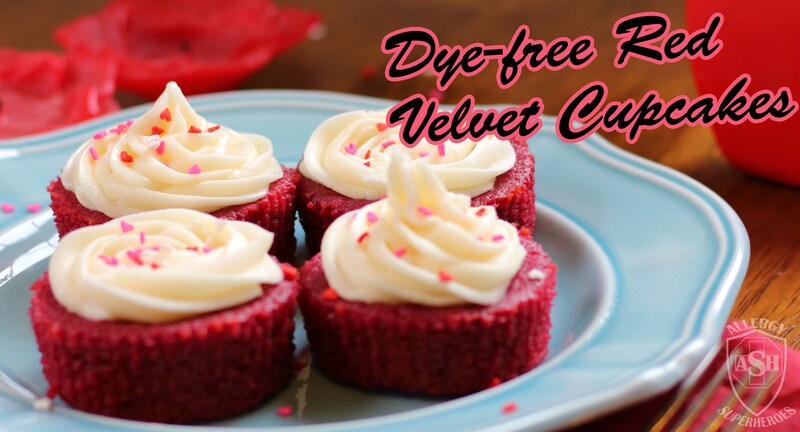 Did you know traditional Red Velvet cake uses a whole bottle of red food coloring? 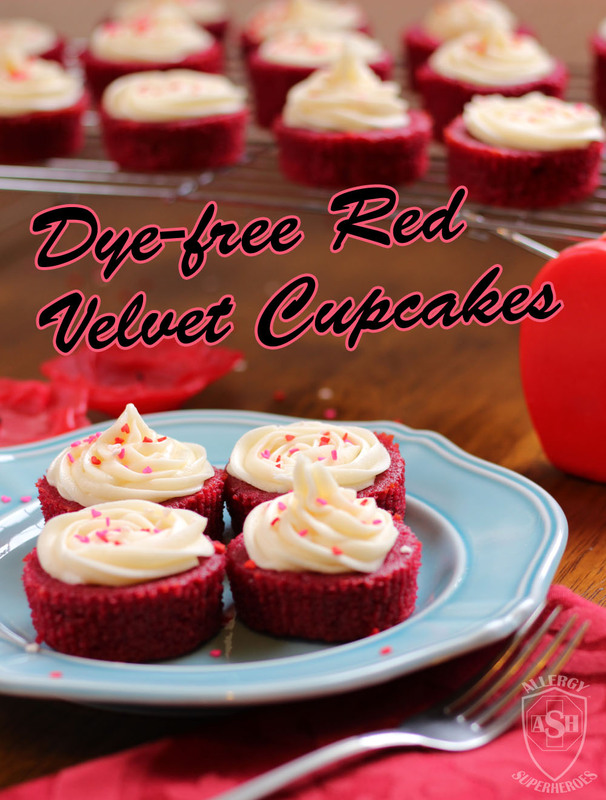 Cut the dye with these great cupcakes, colored with beets! Trim the ends off your beets, scrub the skin, and wrap unpeeled beets loosely in foil. Bake at 400 degrees for approximately 1 hour. Allow to cool. Peel cooled beets, chop into large pieces, and place them in a blender with 2 Tbsp water. Cream butter in mixer until smooth. Add the beet puree, applesauce, and oil. Mix until incorporated. In a smaller bowl, whisk together flour, cocoa powder, salt, and baking powder. With the mixer running, alternately add the flour mixture and buttermilk. Mix just until incorporated, do not over mix. Divide among cupcake liners, filling them 3/4 full. Bake for 20-25 minutes, until a toothpick inserted into the center comes out clean. Cool, frost as desired, and enjoy! Don't be put off by the prep time, most of it is passive while the beets bake. Do this step ahead of time so you're ready to roll when you're ready to bake. You could possibly save time by pureeing canned beets--but don't quote me on that, I haven't tried. Contains dairy, wheat, and corn. Free from peanut, tree nuts, egg, soy, fish, shellfish, and seeds. If you don’t have enough acid in this recipe, the beets will give it a brown color instead of red. Hence the buttermilk, and also why you don’t want dutch-processed cocoa. Did you know that cocoa is an acid? This was new to me! Okay, so I added a little food dye with the sprinkles. But those are optional. Unfortunately, these cupcakes came out pretty flat (though it was better than the craters on the first batch!) 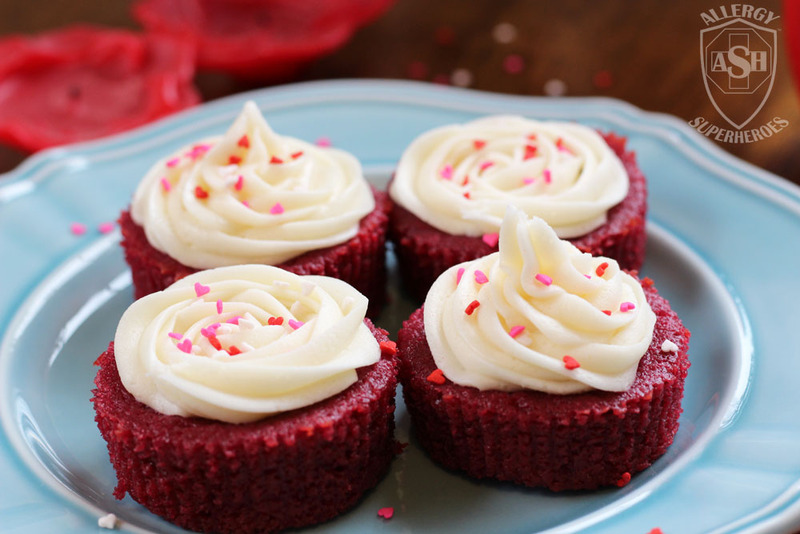 This is a recipe I’ll definitely be revisiting, but who can resist safe and healthy(ish) Red Velvet for Valentine’s Day? Flat cupcakes are just an excuse to add more frosting! Do you avoid artificial colors? What do you use instead? ← Previous Previous post: Top Blog! Red 40 dye doesn’t get along with my daughter, so this is helpful. Pinned! Thanks for sharing it at the Healthy Living Link Party! I`m not a big fan of artificial colors. But I never thought about using natural ingredients. This is such a great idea! Just a note to let you know that I have chosen your post as one of my features for this weeks Real Food Fridays blog hop that goes live every Thursday @ 7pm EST. Thank you for sharing your valuable information with Real Food Fridays and helping to make this a healthier world. Awesome Marla, thank you! I’ll be sure to check that out! 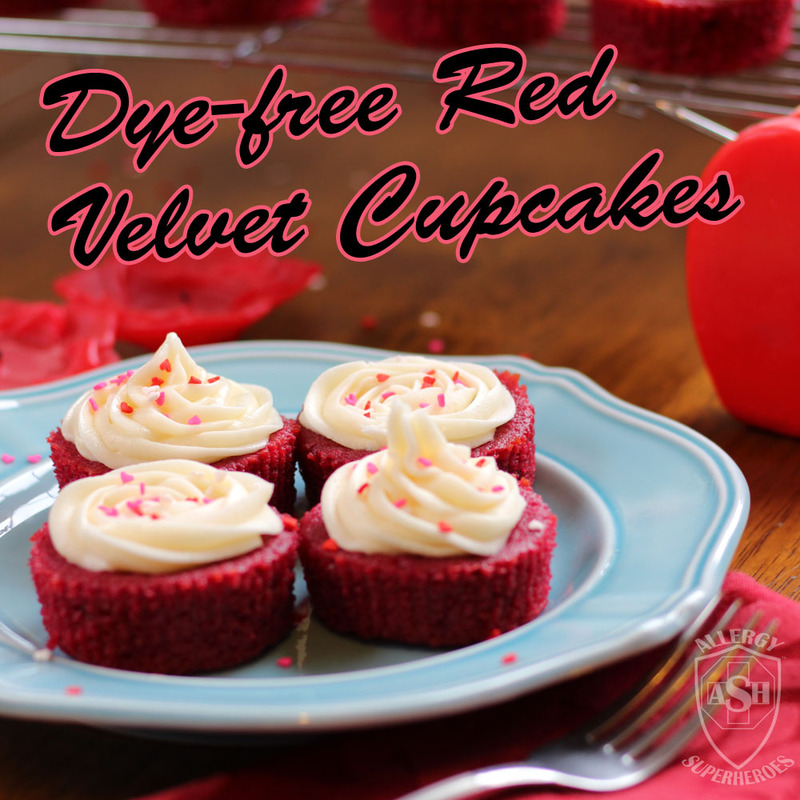 Your Red Velvet Cupcakes look delicious, Eileen, and I love that they are dye free (and healthier too!) thanks to the beetroot and applesauce. Scheduled to pin to a shared board. Thank you for being a part of Hearth and Soul. I hope you will join us again next week! Thank you April! Healthy(ish) treats are always so much nicer–at least there’s less guilt! I have been meaning to try making a chocolate beet cake, but I may need to give this recipe a try instead! Love using real food for dyes. I use fruit purée in frosting – it’s light in colour but does the trick. It’s definitely worth trying! I truly was worried about the flavor but like many surprising additions, it didn’t diminish the cake at all! I haven’t heard of beets in chocolate cake. With the cocoa it’s not for color–what’s the advantage?